Should You Get a Flu Shot? Your Questions Answered! Did you know that nearly 1 in 3 adults over 65 years of age did not receive a flu shot last year? * And yet, our senior loved ones are particularly at risk for developing complications from influenza, such as bacterial pneumonia. Each year in the US, there are over 65,000 deaths attributed to influenza and pneumonia. * The good news is that this year’s vaccine is now available and can help lower your risk of coming down with the flu. 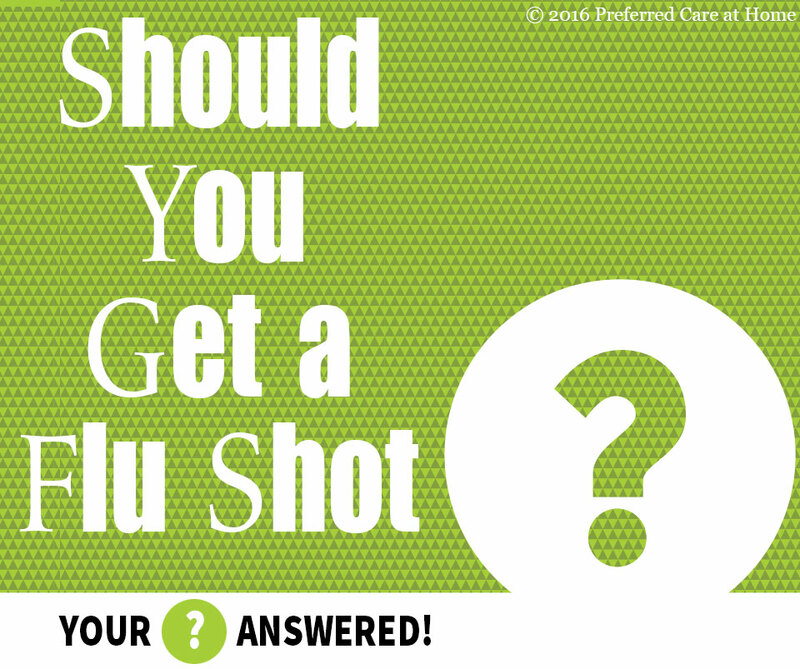 Here are some frequently asked questions regarding the flu vaccine. Do I need another flu shot if I received one last year? The influenza virus has a tendency to alter itself very quickly which means that a yearly shot is needed to give your immune system the best chance to fight the virus. The Center for Disease Control and Prevention monitors influenza infections and then predicts which forms of the virus will be prominent during that flu season. The vaccine is never 100% effective, but ideally protects you from the virus subtypes you are likely to encounter throughout flu season. I don’t like shots. Is there another option to obtain the influenza vaccine? The intranasal flu vaccine (FluMist) has traditionally been available for healthy, non-pregnant individuals between 2 and 49 years of age. However, the CDC Advisory Committee on Immunization Practices does not recommend the use of this vaccine during the 2016-2017 season. This recommendation is based off the 2015-2016 flu season, in which the flu shot was much more effective than the nasal mist. Should I received the flu shot if I am allergic to eggs? Most flu vaccines contain a small amount of egg protein that is a safe remnant of the manufacturing process. However, this can be a serious concern for individuals with an egg allergy. Fortunately, there are two formulations of the vaccine that are produced without egg protein. It is important to discuss your egg allergy with a health care provider and consider receiving FluBlok or Flucelvax instead of other standard vaccine formulations. Are there reasons I should not receive the flu shot? The rule of thumb is that most individuals 6 months of age and older should receive a flu shot. However, there are some reasons you should avoid the vaccine. These reasons include if you had a severe allergic reaction (anaphylaxis) to previous flu vaccine or if you developed Guillain-Barre syndrome within 6 weeks of a previous flu vaccine. Where can I go to receive the flu shot? * Bacterial coinfection in influenza: a grand rounds review. Chertow DS, Memoli MJ JAMA. 2013 Jan;309(3):275-82.